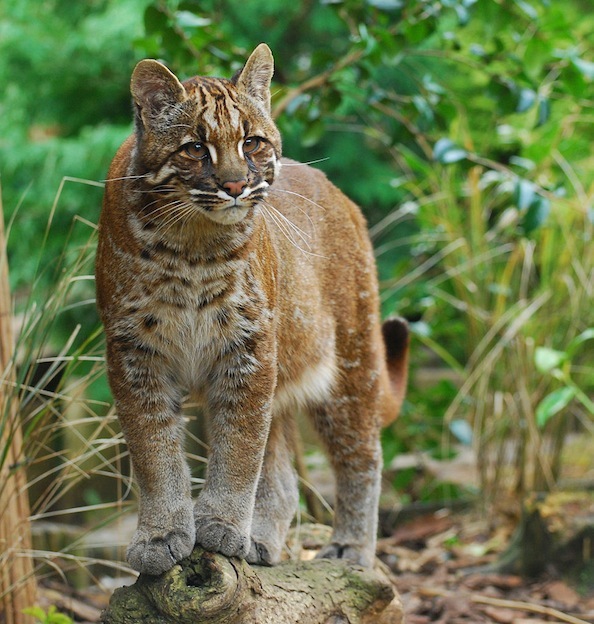 The Asian Golden Cat is one that is medium in size. It was first discovered by a zoologist in 1827. They look like a domestic cat in many ways but they are quite a bit bigger. The average size of an Asian Golden cat ranges from 20 to 35 pounds. They have a very long tail that is flexible. That tail averages 20 inches. The Asian Golden Cat is usually some shade of golden brown. However, they can also have a reddish coloring to them. Some feature areas of black or gray as well. Spots and stripes can be found on the bodies and that often results in them being mistaken for a young Leopard. The area of Southeast Asia is home for the Asian Golden Cat. Areas where they have been identified include Tibet, India, and Bangladesh. The survive in a variety of different habitats. This includes the rainforest and areas with rocky tracts. They live in altitudes up to 9,800 feet. They seem to enjoy rocky areas where they have plenty of hiding spots. There are some areas of the Himalayas where they are found living on the open plains. A few years ago some of them ventured into Nepal in search of new habitat where they can find food and thrive. We don’t know very much about the behaviors of the Asian Golden Cat. It is very difficult to observe them in the natural habitat where they reside. What we do know about them is typically observed in a captive state. They communicate through a variety of sounds including purring and growling. They are solitary and very territorial so they leave scent markings from urine on trees as they move around. They also rub their bodies against trees as a means of releasing that scent. There are several different types of prey that the Asian Golden Cat consumes. They include birds, rodents, and various types of reptiles. They also feed on the Sambar Deer. Sometimes they can take down the young calves of the water buffalo. They are very strong animals so they have no trouble with prey that is larger than they are. The female Asian Golden Cat is ready to mate around 1 ½ years of age. For the male it is just a bit longer – about 2 years of age. The mating process is one that is very aggressive. The male will bite the neck of the female They will go their own way after mating has occurred. The young will be born about 80 days later. A typical litter is from 1 to 3 kittens. They will be born in a den so that they have protection. Due to hunting and poaching the number of the Asian Golden Cats continues to decline. Conservation efforts are in place to help protect them. Even so, the illegal killing of them continues and it is very hard to enforce laws or to catch those responsible. They aren’t considered endangered yet but very close to it. Some Asian Golden Cats living in captivity. They don’t seem to thrive very well in such an environment which is why they are often left in the wild. Efforts to help save their natural environment is very important too. The beliefs of the people in Thailand can also make conservation hard. They believe that by burning the fur of the Asian Golden Cat or by consuming the meat from it they will have a way to keep Tigers away.